including coarse washed sand, black dirt (tri-blend garden mix), Class #5 and playground gravel. A layer of mulch will help stop many weed seeds from germinating, reducing the need for herbicides. And mulch helps soil retain moisture, reducing the need for watering. Mulch also can improve the appearance of your garden. 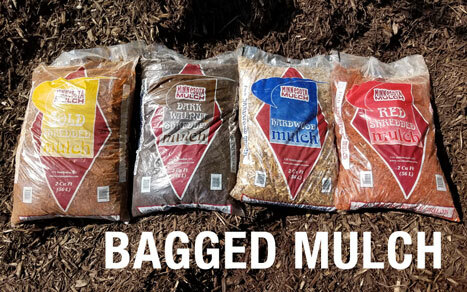 Bark mulch provides uniformly rich colors to make your plants stand out. And mulch can keep plants clean by preventing soil from splashing onto leaves during rainstorms. 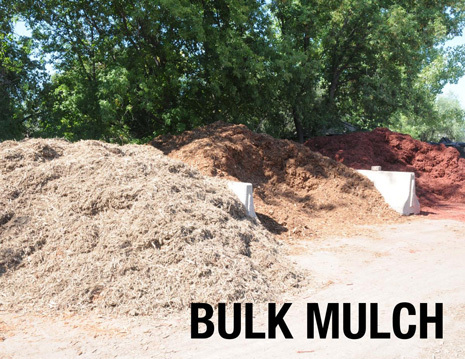 Our mulch improves the quality of your soil as well, by adding organic material as it decomposes. Below are basic formulas that can be used to estimate materials. If you have any questions about material estimating, call your nearest Patio Town store for friendly expert advice. 1 cubic foot of rock = approx. 100 lbs. 1 cubic foot of rock covers 3 - 4 sq.ft. at 3" thick. 1 cubic yard of dirt = 2,000 to 2,500 lbs. 1 ton = 2000 lbs. Decorative rock should be placed at a depth of 3"
Wood mulch should be placed at a depth of 4" to 6"
1 yard covers approx. 108 sq. ft. at 3" thick. 1 yard covers approx. 81 sq. ft. at 4" thick. 1 yard covers approx. 54 sq. ft. at 6" thick. 2/3 yard covers approx. 72 sq. ft. at 3" thick. 2/3 yard covers approx. 54 sq. ft. at 4" thick. 2/3 yard covers approx. 36 sq. ft. at 6" thick. 1/3 yard covers approx. 36 sq. ft. at 3" thick. 1/3 yard covers approx. 27 sq. ft. at 4" thick. 1/3 yard covers approx. 18 sq. ft. at 6" thick.